What was in their Houses? Although my talk was given on St, George’s Day it doesn’t link parish history with the famous saint. The truth is that our local history has very little connection with famous people, that is people of national importance. Near misses there have been, and some tenuous links with the newsworthy appear occasionally. We’ve had near misses, too, with the big families of South Devon nibbling the parish edges; the Cliffords of Chudleigh came to own Luton for a time by marriage, the Courtenays of the Earl of Devon family have owned land in Teignmouth; the Bishops of Exeter were absentee landlords for 500 years after we were part of the royal domain of King Edward the Confessor and his predecessors, also absentees. But for the last 250 years we have been under the local influence of the Lords of the Manor, the family of Comyns, and happily they are still with us. I’m now going to work quickly backwards through time to give you a sense of the proportion of time. To 1900 which is, in living memory I don’t propose to tell you anything about this period because a splendid show was recently mounted in this Village Hall and I hope someone is collecting the history that emerged from it. Now 150 years ago the gentry came here, building big and medium-sized houses and giving the Villagers a chance to diversify from a purely agricultural economy. 400 years further back the Bishop of Exeter pulled out. 500 years earlier and the parish was a Royal Manor under a Danish King. That was 1000 A.D. A further 500 years and the Saxons were just arriving in Devon. During the previous 500 years, while the Romans were in Britain, Devon was becoming some sort of a cohesive county. That’s 2,000 years and this area had just about got its name. 2,000 B.C. was the time of the Druids and Stonehenge, with very scattered and meagre families on Haldon and Dartmoor; it was the start of the Iron Age. 4,000 B.C. was considered in the 1800s as the time of Creation. This theory was worked from biblical evidence and set the vary first day of the World as 23rd October 4004 B.C. It was propounded by Or. John Light foot. I have to go a bit further back still, some 280 million years when a volcano erupted to throw Dartmoor up to a height of, perhaps, 15,000′. Since then, other earth movements, large and small have affected this parish, for instance, the Great Lower Red Sandstone Ridge was pushed up to run from East Dawlish north past Exeter, to a height of perhaps 10,000′. In those 280 million years vast changes in climate have worn away the high ground, and immense floods up to 1,000′ deep have consolidated the sediment from it to form now rocks; the last ice age retreated from here only about 20,000 years ago. All this had a bearing on the formation of our village and I’ll come back to it. By the year 8 A.D. this area had got its name. Devon was sparsely inhabited by Iron Age people; they had come from Southern Europe; they ware Celts, remembered as the first people ever to wear trousers. They called the water of the estuary ‘TAIN’, meaning simply ‘Water’. Some of them settled on the estuary banks, and those who formed a clan on this side called the south facing slope, ‘TAINWYK’; where ‘WYK’ is the spread of family land or settlement. WYK lasted until, say, 700 A.D. when Saxons infiltrated and converted British, or Celtic, words into what is now called Old English or Anglo-Saxon. They called it ‘TAINTON’, or ‘TAINTONA’, still the settlement along the Tain, the settlement that stretched from the river mouth as far as the present racecourse. By 1200 the spelling had changed to ‘TEYNGTON’ or so, and about the 1300s, Bishops’ or the Latin equivalent ‘Episcopi’, was tacked on to the and. Since then over 40 different ways of spelling the name occur, until around 1850 it settled into its present form as one word. You will note that we have kept the pure form of TAIN, while Teignmouth has somewhat corrupted the pronunciation. That form has travelled down the south bank from Teignhead, Stoke and Combs, which is derived from the Saxon for TEN HIDES, TINNED. This was a parcel of land, ten hides in extent, granted to a local monastery, or Stoke, when it was established there. When the Romans left Britain in 442 A.D., the Saxons, Jutes and Angles ware starting to arrive. This was Arthur’s time and it is worth looking at the South Devon area to see what existed then that still exists to-day. Earliest man and some animals lived and left their remains in the limestone caves at Brixham, St. Marychurch, Torbryan and Chudleigh. There is an isolated, wooden, Neolithic house site near Haldon Belvedere, built in early Roman times. There is a small area where villages still have Celtic names, at Trusham and Dunchideock. The Celts built hill forts, usually round the perimeter of their family territories, and we find these on Haldon, at Paignton, Kenton, Exminster, Highweek, Mile End, Denbury, Holcombe, Milber and Ugbrooke. Also there is a Roman road from Exeter crossing the Teign at Teignbridge. Slowly these Celtic families got together after 500 A.D. Leaders appeared and the whole area from the English to the Bristol Channels was called Dumnonia, the place of the people of the land, and that led to the tribal name of Devon, Dumnonians. These people were stay-at-home farmers. When a chief or king emerged, he was someone who collected a few warriors to his household, either kin or loyal followers called ‘hearth companions’ or a war band. They owned weapons as well as the will to travel in order to collect tribute and food from the unorganised peasants. A king didn’t administer his district till about 700. His war band in the 300 years after the Romans left was from 6 to 35 men, and an army had more than 35 men in it but was very remarkable if it had more than 80. Dumnonia was infiltrated by small families of Saxons, coming from the sea at first, creeping along the lowlands and valleys of the coastal plain to make their farms hare. In 710 the Dumnonian chief, Geraint, was defeated by the combined army of the Saxon kings of Wessex and Sussex, after which several waves of Saxons overflowed from Wessex into Devon and colonised here. Tainwyk now became Taintona, still denoting an area rather than a village. Then the Danes came. In 876 they captured Exeter and were thrown out by Alfred. In 1001 they sailed up the Tain here, burnt Taintona, probably Kingsteignton, and went on to capture Exeter again. They made a truce in 1002 but were soon defeated and massacred by Aethelred. They persisted and re-took Exeter as well as all Wessex until, under Canute, a Danish king in 1016, they swept west through all the County.. They took the land as they found it, leaving very few Danish names here, indeed, meaning they took the land as a minority people. Dumnonia had become Saxonised as Defnum or Defenum and only later as Defenscir. So you have a good historical precedent to call it either Devon or Devonshire. By 975 the system of Shires, their boundaries and controlling families, as well as parishes, were fully established, so when Edward the Confessor was crowned in 1041, Taintona was a parish in its own right and part of a Royal domain, overseen by one of the king’s officers. Incidentally, if you are searching for an early ancestor, to be Anglo-Saxon you must be tall, fair and have a blood group ‘A’; and to be Celtic* shorter, dark, with a blood group ‘0’; and if you have a love of litigation it may well be inherited from the Danes. So, with the parish established we can look at it to discover how it had developed by the early 1000’s. There were by now two settlements Taintona and Luton. You can look down over Luton from one or other of the roads from Haldon, and with your imagination removing the new houses there, see a village as it might have existed 1,000 years ago. The buildings are different, the fields are bigger and they spread wider, and the surrounding forest has largely disappeared. You will see two or three farms close together, another three spread along the combo towards Rixtail on either side of running water, a mill, two barns and some farm workers cottages; and tracks connecting them together. The history seems to be as follows, and here I have to start inflicting Anglo-Saxon words on you. The Saxons colonised the valleys of the coastal plain and there seems to be a record of two ships arriving at Dawlish, or DOFLISH as it is spelt in a charter of 1044. Doflish means Devil’s Water, or Black Water, unsuitable for drinking at that time. So the Saxons went up the stream to Ashcombe; combs is simply a valley, so Ashcombe is the valley where the ash trees grew. From there they came aver the hill to the Luton combe where the first settler was called Sherry and he called his home the area Sherracombe, now Cherrycombe. When the land prospered, a man called LEOFWYN, pronounced LEFFIN, formed a settlement at the end of the combe, a TON again, and Leofwyn’e ton, through LEVERTON and a little slurring, became Luton. The farms here are HAYES, meaning enclosed fields, and HAMBLECOMBE, the homestead by the combs. Up the valley, towards Dawlish, we find Rixtail, first recorded as RIXSTINIEL. The last part means a stone Hall – an important place then – by the C, or Rushes. By 1300 Nether Rixtail was a farm too. As late as the 1800s there was still a patch of common land on both sides of Rixtail farm and that could well be a legacy of the time when anyone who wanted to see the owner of this important house could camp there, or could claim the protection of the lord there. The other farms in Luton are, or were, Marsden – a much later derivation from a family name – and Lewes whose origin is not at all certain but it could denote the burial ground of the Saxons. Also there was one called Bullhorn last century. But from Rixtail over the Teignmouth road there is WOODHOUSE farm, a slightly lower category of house than the Stone Hall; it is now called Home Farm. That was the Saxon enclosure in the Combe. Now we look at the surroundings and find them named by Saxons as seen by them. Opposite Woodhouse is CHARLWOOD, the wood where the CEORL lived; that is a generic term for a superior husbandman who was free, could carry arms and was usually a Briton. We also have WOODOFFICE, meaning the edge of the wood. In other directions we have COLMERSFORD, on the Luton to Lindridge road; a COELMAR was a local British peasant and a ford was a stream-crossing. Then HUMBER, probably Hunda’s Hill or possibly Hounds Hill. Towards Chudleigh there is WELL covert, where once was WALE Farm; a Weals was a foreigner, who to a Saxon was a Briton; and Ideford, or IDDEFORD to some. In the 1340s there were two tax inspectors who were as confused as you may be about the name of the place. One spelt it YUDOFORD and the other, two years later, spelt it YUODEFORD. It is the same FORD, with IDE meaning either Ida’s Ford, or Yudd, a Devonshire way of saying Wood, the ford in the wood. This is a picture of a self-contained settlement with the places named in a personal, possessive way by the owners who have taken the land for their own livings. when we look at the names further away still from Luton, we find a distinct tendency to names of a functional character, as though the inhabitants were there because they had to describe the tribal lands in which they existed; so they used descriptive names taken from nature. Take Lindridge Hill, the hill where the lime trees grow, running from Lindridge to Sandygate: this is the indigenous and now nearly extinct lime, with the small leaves that produced the best wood for making shields and implements, as well as having an inner bark that produced baste for the making of ropes, And Whiteway, along this limestone ridge of white rock; I’ll come to others later after I’ve finished Luton. In the early 1600s, Luton was sold as part of Lindridge Manor, to the Martin family when the Bishop’s estate was broken up. Among the last of the Martin line was a daughter who married the first Lord Clifford of Ugbrooke, and she took with her the manor of Luton as a dowry. So it was separated from Lindridge. Soon after this, in the early 1700s, the Vooght family settled there, at first as tenants and soon buying some of the lend from the Cliffords, a process that has continued through 280 years. The Vooghts almost certainly came over from Holland with William of Orange in 1688 and decided, when they reached Cludleigh, that they liked the county. They dropped off his retinue and settled here. They have seen Luton rise in size to 50 houses in 1878 with 220 grown people there, and decrease again to its present size. From there we go on to Taintona which was bigger altogether. A map of our present roads would show the estuary to the south with the inevitable track following it. Parallel end starting from the east is Combe way. A simple combe this time and so probably the first or most important combe to be given the name. This Combeway passes Ashill, the rising ground between the road and the Lea, to reach Radway. Radway goes down the hill to Cross and on down to and beyond Cockhaven; it also branches right along Fore-Street, the main street along which the village developed, on into Forder Lane, over the ford and on to Ware and Kingsteignton. Radway also forks into Back Lane, now Manor Road and Teign View, straight through to Humber Lane via Colway-Cross and Laury Lane. Back Lane forks in turn to go up past the cemetery to Humber and Luton. One last road – up from Ware Farm, past Colway Cross and out of the parish past Castle Dyke. Now, to clothe these bare bones, we go to William’s Domsday Book of 1086 to see what sort of a place Taintona was. Domesday was an inquest to record who held what and by what right, and all the Facts as could enable the authorities to assess the-owner’s capabilities. It recorded. the value of each manor, the amount of arable land, the number of plough oxen separating the Lord’s and peasants’, the quantity and categories of the adult inhabitants, classed mostly as villains, or husbandman, borders or smallholders, and slaves, also the amount of woodland, meadow and pasture. These were prime manorial attributes. When the Bishop received it, the yearly worth was £14; now in 1086 it is worth £24. Which shows that the Bishop or his steward had improved the Manor, probably by stocking it with sheep. The Bishop who received it was Leofric, pronounced Leffric of Exeter and the year about 1050. Leofric was a Saxon name in a Danish kingdom, though he was of British extraction and of German education. He came to be the King’s Chancellor and a Royal Chaplain before receiving the Bishopric. The king was Edward the Confessor, a Dane, and the estate he gave to Leofric totally stretched from the sea at West Teignmouth to Chudleigh, but did not include Kingsteignton, The gift was probably made soon after the coronation in 1046 and was part of the Royal Manor that took in all this part of Devon. Leofric was the Bishop who got permission to remove the see of Exeter from Crediton to Exeter. A few years earlier, Leofric, then the King’s Chaplain, had received from the king, on behalf of the Cathedral, a gift of the Manor of Dawlish. The charter for this is still around and I will refer to it later. From the Domesday record we note that the manor is wholly pastoral, apart from the saltworks, and that West Teignmouth does not have a separate mention, as it was part of the manor. Numerically, the manor has the largest population of all the manors south of Crediton, but the density of population is less than in the area south of the river where there were a number of smaller manors. Our parish population was divided into 18 family holdings, which is what a hide denoted, of which five lived on the Bishop’s manor farm and 13 in the rest of the manor; but these 13 would be sub-divided into 51 homesteads which averages four to each family, rather more than the average for the whole of Devon, which at that time had only 1,126 family holdings. The hide was supposed to be the amount of land necessary to support the family living there. It is the subject of much academic argument, and down here it seems to have been 48 acres of cultivated land plus 16 acres of waste land for cattle etc. The league is an unknown measurement as well; but by using a stocking rate for sheep at one to the acre, we find it would be 920 yards. Thus our picture of the manor in 1086 is of a well wooded countryside below the waste of Haldon, with oaks, beech being plentiful, much as you can see over the river at Netherton now, with 1,300 acres of cultivation, 200 acres of protected woods and 3,200 acres still in the rough state. One fifth was in use and four fifths natural. I mentioned 13 homesteads, so now let us see whether there are 13 present day farms with names derived from the Angle-Saxon; and here I repeat you will be hearing the functional names used by the British before the Saxons came and turned them into their own language. We have had five at Luton. Now Combe is the place to start with, simply Combe, a good Angle-Saxon word for a valley as a landscape feature; then Ashhill, the hill where the ash trees grew, that’s two; and Radway, usually said to be so named because it was the way across the red soil, but RAD can also mean grass, and roads were named from their destination; so Radway, or Raddaway as it used to be, is the way to the grass pasture, the old common pasture where sheep and cows would be sent in summer, Then SHUTE, a well-known name in Devon, meaning a little holding between and part of two manors, that is between Radway and Taintons manors; and Cockhaven, from the Angle-Saxon CAEC, a causeway and Venn a bog or marsh, It was unlikely to be a farm then but the causeway led to Rydon, meaning a community in a clearing. I’ll come back to the marsh later. Next we have West Town, a farm here standing where the Methodist Church now is, where TOWN is a farmstead, or more likely two of them together. There’s Ashwell, where WEIL is a stream and not a well as we know it now, the stream through the ash plantation where we still have a field called Rowden meaning a clearing in the waste, And Venn, again the marsh which is still there; and Ware and Wolsgrove that I’ll come back to. With one apparently lost farmstead at LEURY still the name of the footway joining Colway Cross to Humber Lane, previously this was LEWORTHY where WORTHIG was a ,word used in the 1000s for a farm holding cleared from the waste, and LE – French ‘the’ – given since it did not have an owner’s name, given perhaps by a Frenchman at Radway. So our parish has taken a shape and form that has been here for well over 900 years unchanged in its focal points of agriculture, and with roads which had their origin in the joining of the homesteads together. However, there was one road that was the exception. This is Dawlish Lane from Wear Farm to Colway Cross and on to Castle Dyke and on to Dawlish Water and on to Exminster. In that Dawlish charter, this road from Castle Dyke is called a STRAETE to the PORTE or market. Straete is the same as in Watling Street, a highway in Roman times, so this was the road to the market at Exminster, a big centre in the 1000s, What did this manor have that was worth marketing for centuries? The product was salt produced by those 24 saltworkers. This was by far the largest saltworks in Devon west of the Exe, and salt was a very valuable commodity indeed. This is one reason why I think the saltworks were at Wear and not at Salcombe Dip, as is usually thought because of the name. Salcombe as an early name but it probably derived from Salix the willow tree. If we accept Wear as the salt centre, we have a logical derivation of Wear itself. This is Latin for a small camp or watchpost, and why should there not be one to protect such a valuable commodity as salt at the end of a Roman street? Finally, we come to WOLFSGROVE, which is close by Wear. This is early spelt WOLSGROVE and it has nothing to do with the wolf animal. Wolfsgrove appears only in 1652. Nor, I believe, does it have any connection with wool since there were only 400 sheep here in 1086 out of the 50,000 recorded in Devon at that time. We go back to the time of Arthur, around 500 A.D. when CADOR, a British Earl of Cornwall, attacked CHILDRIC, a Saxon leader and drove him to the Teign where the Saxon ships were moored. Cador’s band overtook the Saxons on the river bank and annihilated Childric and his 24 knights; 24 knights at that time was a sizeable army. Now WAEL means slaughter, so we could have the derivation Slaughter Grove or Coppice, as a record of an historic event in the lives of the local Britons. So there you have the difference between Luton and Bishopsteignton villages. Luton, personal names given in the Saxon tongue, and this village functional names saxonised from the earlier British usage when the newcomers infiltrated into this part of Taintona. Had the Saxons fought their way in here they would likely have re-named all the existing places when they killed or enslaved the owners. A geological map of the parish shows one thing we can boast about, and that is we have probably the most complicated geological formation of any village in Devon. The detail here shows each different formation In a different colour or sign. There are 10 different soils and seven geological faults in the parish. The map shows why gardeners must be careful when talking to each other because each may well have a soil with different inherent characteristics which naturally affect the plants he is talking about. The Devon Red Sandstone was pushed up millions of years ago. Successive ages of ice, huge floods, temperate conditions, immense rains and complete drought have broken it down to soil and a lot of it has disappeared into the Channel. But a useful layer has remained with us, shown blank on the map. Some of the washed-down soil has been compressed under 1,000 feet or more of sea into conglomerate rock, such as you can see down at Red Rock and at Shaldon. In all, you find three different kinds of red stone used in building locally, the virgin rock from local outcrops, the conglomerate I’ve just mentioned, which has layers of pebbles in it usually and is softer than the rock, and a third type, known as Exeter Traps, that has black patches In it to give the appearance of bits of burning. It is a basalt, found locally near Dawlish Land and is of volcanic origin. On the map Haldon has a centre of one colour; this Is the Haldon Gravel and Flint, a product imported by the elements at some time, possibly from East Devon, and useful to the Iron Age people for the manufacture of edged flint tools. Around it is a ring of Greensand formed about the time very primitive life came to dry land. Here fossils have bean found; it is on the 670 foot contour and is really the beach formed when the ocean was this height above the modern level. It is an important local feature out of it come the clear clean streams that flow all the year round and in out of which places like the Bishops Palace, Rixdals, Luton, Ideford and Puna Lane were established originally. In the rest of the village, water is newer far below the surface, not so pure but easily reached. The nucleus of the old village is on a comparatively dry surface of shale and grit, an area nicely surrounded by the old roads of Fore Street, Berry Hill, Back Lane or Manor Road and Radway Hill. The red soil has its edges exactly on the other side of Radway Hill, Shute Hill and Church Road. Remember the origin of Cockhaven Lane. This road runs exactly along a geological fault that continues up across to Black Railings. The fault is dry but it causes wet conditions on both sides of it. This causeway leads to the drier valley gravel and clay of Rydon. From Berry Hill west along Forder Lane there is slate and mudstone, a mud deposit compressed into stone layers, very hard when it lies flat but friable and porous when it breaks up. The other main feature is limestone, lying in a ridge in the west of the pariah. There are several disused lime kilns around, about six or seven of them, mostly near Durley Lane, but two in Happy Valley, and field names show where five or six more once were. Lime, that is slaked, burnt lime, was found to be of the greatest value on our red soil about 1760 when the building of these kilns was profitable. Previously sea sand was extensively used on the soil and lime burning fell off when outside fertilisers, such as guano, was imported cheaply. Back to the 1000s, now, the Lordship the Bishops held here lasted exactly 500 years, from 1049 under a Danish/English king to 1549 when Edward VI reigned, between Henry VIII and Elizabeth I. The estate that Bishop Leofric received was divided into three manors, Taintona, Chudleigh and Ideford, and since the king didn’t give away the whole of Taintona, a new boundary had to be made between the king’s part and the Bishop’s. This may have coincided with the ancient parish boundary. The ancient parish boundaries were church divisions of the land and were made between 700 A.D. and 1100 to denote the geographical areas from which the local church received its tithes. Payment of these was compulsory and they were used in part for paying the clerk, in part for maintaining the church fabric and in part for relieving the poor. Leofric divided the parish into four manors, Radway, which held the Bishop’s home farm among others, Taintona, along the estuary, Lindridge with Humber, and Luton; then about 1250 Bishop Blondy created a fifth manor of West Teignmouth. Lindridge Manor we know very little about; Luton Manor is believed to have existed till the 1600s when it seems to have passed to Lord Clifford when he married the heiress owner of it. 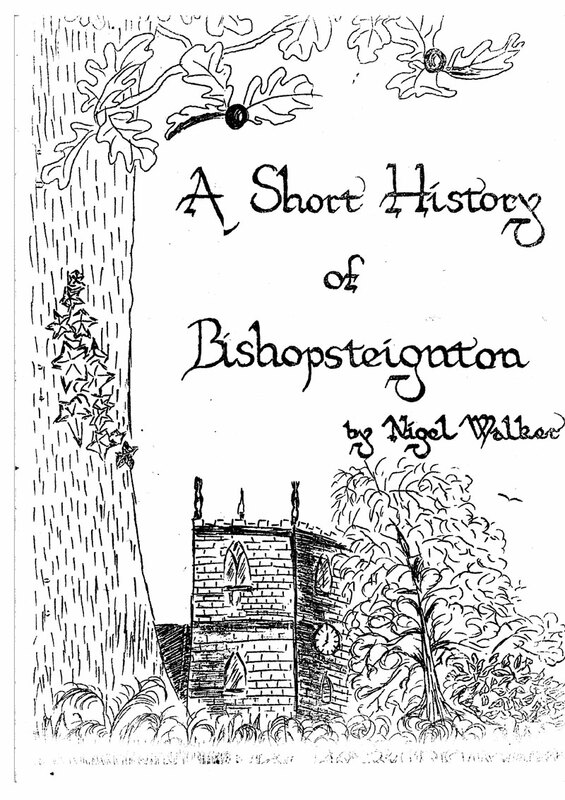 Since those two disappeared the parish has run with Bishopsteignton and Radway together under one Lord of the Manor. Radway is a good place to talk about now. The Old Walls, or the Bishop’s Palace, you can still see there consist of part of the chapel and some of the curtain wall that surrounded the palace grounds. The first use of this site was for a monastery founded by Kind Aethelstan in about 932 for Benedictine monks who stayed there for 120 years. Aethelstan defeated the Celtic King Huwell in 927 on Haldon Hill and, if field names are reliable and folk memory is any guide, these two signed a treaty in Peace Park, a field Just below the old palace. This period is possibly when this part of Devon became a royal manor. In about 1040 Bishop Leofric persuaded King Edward the Confessor to remove all the Benedictine monks from Devon, because, he said, they were becoming slack. He preferred the Rule of St. CHRODEGANG for monks and the use of secular canons; these were people who travelled to the villages and churches to preach, while monks stayed in the monasteries. The secular canons were reinforced by friars who were also travelling preachers after they had established houses in Britain from the middle 1100s. Bishop Bronescombe comes on the scene (1258 – 1280) when the friars were still around, with a decision to build himself a palace here; all the country houses of Bishops were called Palaces regardless of size. He died here, in fact he came here when he felt his end was near. Fifty years later Bishop Grandisson re-built the palace into what he describes in his will as a sumptuous house for himself and his successors in case they had nowhere else to lay their heads should the Bishopric lands be taken away from them. Grandisson also tried to claim all the tithes for himself to augment the manorial income, but he was strenuously opposed by the rector of the time, one William Kaignes; in the end the Bishop gained the Great Tithes, worth then £20 p.a., while the parish priest had the Lesser Tithes worth say £5, and with this decision the incumbents became Vicars while the Rectory went to Radway. Later, Bishops spent little time here, so the palace gradually deteriorated until, in 1547, after the Dissolution of the Small and Great Monasteries, King Edward VI, after the Act whereby all manors, lands, tenements of the Friars shall be had and enjoyed by the king and his heirs, recommended to Bishop Vesey that he hand all his country properties to the Crown. 60 years later, when the manor was sold piecemeal, we find a certain Thomas Whidborne buying Old Walls with Ashhill and taking away the stone to make his own house and farm walls. Even then the description of the palace was ‘Old Walls’. This act of freeing a slave was a form of Indulgence, and that was a remittance by a Bishop of a certain number of days’ penance when the recipient undertook to do some pious or meratorious work in return, or to give some of his money for such a project. Thus, freeing a slave was pious work because a slave was a chattel and was not considered to have a soul. A freeman did have a soul and so had a chance of eternal life in Heaven. Other works that earned indulgences were, the keeping of roads and bridges in repair, building churches and repairing them, and supporting the poor. In 1434 Bishop Lacy granted 40-day indulgences for contributions to the Magdalene Houses, or hospital, that stood on the Teignmouth to Exeter road, and in 1449 to everyone helping to repair the Sanctuary at the back of our church. This Sanctuary was dedicated to St. John the Evangelist. It was established by Bishop Grandisson about 1350, the time of the Black Death. Sanctuary had grown since Saxon times out of the act of a criminal taking refuge from civil Justice in a church. He has allowed to admit his offence before a coroner and swear to abjure the kingdom for life; he also lost all his property to the king. Abjuring meant he went immediately into exile abroad. He went to the nearest port escorted by a church member. He went, quote, ‘un-girt, unshod, bareheaded, in his bare shirt as if he were to be hanged at the gallows, having received a cross into his hands.’ Radway offered better protection to local criminals because of the number of Friars there, and it had grown into a Greater Sanctuary, which was where a criminal could reside and do productive work within the precincts of the Sanctuary for the benefit of the Friars. Radway, by Grandisson’e time, had become a very ungracious major sanctuary and one can understand the Bishop removing it from the site of his new palace. So this new chapel was really a sanctuary prison in which criminals earned their keep. The field round it is still called Sentry Field, shortened from Sanctuary Field, the productive prison yard. Sanctuary was restricted by law in the 1500a when treason, felony and murder became crimes for which there was no right of sanctuary. Also as travel became easier at this time, a sanctuary man was branded with an ‘A’ on his right hand to make recognition easier. It was finally abolished in 1623. Our sanctuary seems to have passed out of use about then, because we find a conveyance of the vicarage from the Earl of Salisbury to John Bourne in 1639 includes the transfer of sanctuary lands. From then on the building has been used as a barn or shad and has slowly deteriorated. Now we go back to the parish itself. You will recall the Domesday Survey said the Bishop paid gold for £20. That was a tax on land assets. This basis of taxation was changed in 1232 to a tax on the moveable goods in a man’s house, that is the standard of living of the individual. Ordinary people were now building durable houses of stone and cob instead of wattle and mud, and making furniture for themselves. The Exchequer had a novel way of doing tax assessments; the writ ran – ‘Every man shall take an oath as to the number, quality and value of his own movables and likewise of his two nearest neighbours. And it by chance there shall have arisen dissensions on this head, the knights themselves by the oaths of twelve good and lawful neighbouring man shall inquire the truth and shall take the fifteenth according to that truth.’ The tax was one fifteenth on a man’s movables. We have just such a tax in a Survey called the Devonshire Lay Subsidy of 1332, which gives us a picture of the manor tenants. The smallest taxable houses were rated to contain eight pennyworth (3 ½ p) of property and the largest in South Devon contained 10s (50p) worth. Surnames were coming into common use by now, especially in the towns; but country families were still called from the name of their holdings. So we can distinguish to some extent between the houses in Teignmouth and those here though they are all listed together, We have, for instance, Martin of Rixtail rated at 12d and Christine of Sherracombe the same, Thomas of Wolsgrove at 18d, the Visor at 8d and Gilbert in the Combe at that 10s. He was obviously doing well since he also lent the Bishop Grandisson £30 to help pay huge debts the Bishop had inherited from his predecessor, Stapledon. In all we can recognise 12 Bishopsteignton homes against a further 58 which might have been in Teignmouth. That wasn’t the only tax, or suit, that tenants had to render. Walter de Thailleur held on from the Bishop for 1/5th of a knight’s fee, Nether Rixtail was held for 1/3rd of a knight’s fee by Nicholas, and Luton for 1/12th. So I imagine the manor was held by the Bishop from the king for a whole knight’s fee. This form of tenure from the lord was used only for those who owed no feudal, manual duties and were totally free men. Also the Bishop’s tenants had to render him yearly in money £15.13.3 ½ (£15.67) paid quarterly together with 2 lbs. of pepper on St. Michael’s Day, five sheep at Easter and 85 hens on St. Martin’s Day, which was 11th November when all the slaughter stock was killed and salted for winter use. As well, a church tax was levied; this was £1.15. 81 (£1.78) that went in part to the poor, part to the church, part to the Pope and 10s to the rector. I must tell you about a transfer of land in the parish in 1292. William atte Were was buying the farm from Henry do Hugheton, the owner. William, besides taking on all the services that Henry rendered to the lord, also has to give Henry yearly, at the Nativity of St. John the Baptists a red rose. This is the recognition that money can buy land, but the undertaking and transfer of services is a privilege that must be recognised by a distinctive yearly reminders for ever as the deed says. What about all the nameless people of the parish? An estimate of the population here in 1500 is 300 people, down a little from the 350 of Domesday; but since then there had been two serious famines due to crop failure and the Black Death. Bishop Grandisson spent the two years of that plague (1328/29) here, so maybe we escaped the worst, though we did have two vicars in as many years. This plague resulted in people moving around a lot more, going to better jobs or just getting away from their own district. Here the population rose to about 350 by 1600 and between that date and 1800 we find 31 family names in continuous residence and a total of 73 family names who were here for over any 100 years, two thirds of the inhabitants. The picture is of the better-off families, mostly yeomen farmers and artisans staying put while labourers and smallholders moved around or died out. The picture includes the clearing of woodland, particularly oak for house building or for smelting iron for nails etc, with charcoal. Fields took the place of the woods. Charcoal burning is remembered in the name Colley Lane, the Teignmouth road between Haldon and Ashcombe Cross. Colley is from Coal, then the name for charcoal, that was burnt in the woods beyond Rixtail Cross. Families had been building proper stone and brick houses and by 1600 had found that an upper floor with private rooms was more useful than a single hall. This permanence resulted in men buying land or demanding, and getting, longer and later leases on the land they farmed; three lives or a hundred years was quite usual. Land became an important commodity to own; it was permanent, it could be mortgaged for a temporary loan in days before banks existed, and it was a splendid status symbol, especially for city merchants. It also provided a steady income, either worked or farmed out; the word farm descends from the ‘farm’ or ‘rent’ paid for the lease of agricultural land. In turn, the income from landed property divided the population into clearly defined social categories. In 1688, at the end of James II and the beginning of William of Orange, the ‘farmer’ category had an income of £42, above him came husbandman with £55, then yeomen, with above 30 acres and income of £911, gentlemen with £280, esquires with £450, baronets with £880 and so on. Below the farmers came tradesmen £45, artisans £38, labouring people £15 and cottagers or paupers with £6. Villeinage and slavery had disappeared by the 1500s and parish care for the poor was starting. A farm labourer, free of service to his lord, earned 10d a day or 4d if food and drink was provided, and a day in 1563 was from 5 a.m. to 7 p.m. with 2 ½ hours off for meals and ½ hour for each drinking allowed by the lord. So, when Bishop Veasy handed the manors to Edward VI, there was a ready market for land. The Bishop died in 1574 and for about 40 years the Earls of Salisbury were owners, having bought it from the king. In 1612 a Richard Whidborne bought Ashill for £664, He was followed by Richard Martin buying Luton, Lindridge and West Teignmouth; William Strode – Bishopsteignton and Radway; Cove bought Green; Hewytt bought Wood; Pidsley bought Wear and Wilkins bought Venn, all within 50 years. Owners and tenants changed often in the next 300 years but the parish had been divided among resident lay owners. The picture is somewhat complicated because there were sales of the – that is the right to present a vicar to the church – and of the Lordship of the Manor. Both these, together with the considerable land acreage came to the Comyns family in due course, and they have been the chief family here since 1728, though they have been around the district since at least 1543 when a certain John Comin remembered the church at Ashcombe in his will. In 1600 there were at least seven separate families of the Comyns clan in the parish, reduced to one for the last 100 years or so. What about the other families? In 1600 there were 115 family names in the parish who lived at least one life in the village, and 38 others who seam to have been transients. By 1800 there were 264 family names with some 40 transients. 31 names span the whole period. A fairly static and contented core of the people here. We know why some names ceased, there was the Lear family with a single daughter, at Lindridge. First she married Sir Thomas Tipping but had no children, then she married in 1728 Thomas Comyns, Steward to the Manor and probably owner of one of the Radway farms. These two were not married in the church here and this probably accounts for the record in our register of the births of their two eldest children where the clerk has written under baptisms, in 1732, ‘Thomas, son* of Thomas Comyns by Lady Tipping’, and a similar entry for the second; but for Mary, the third, he wrote ‘daughter of Thomas and Mary Comyns.’ He may have been peeved or he may have been name dropping. There was Henry Eastchurch at Wood who went bankrupt and had to sell the property to Moses Gould of Dunscombe to whom it was mortgaged. Henry couldn’t or just didn’t pay his church rate of 10s for three years but the village shamed him into catching up with this debt by electing him a churchwarden. They kept and collected the rate accounts. The Cove family owned Green and lived there at least from 1615 to 1869 when James Cove moved to Exeter because of ill-health. The family was around before they bought Green. We know Nicholas Cove subscribed £25 in Bishopsteignton’s quota (1589) to Queen Elizabeth’s defence fund against the Armada. It is tempting to say they came to the parish from Exeter because of this story of 1537 when the Exe was running very high and fast in flood against the old wooden bridge, due to an exceptional abundance of rains. John Cove lived in the house built on the end of the bridge. During the night the bridge collapsed and John awakened to find to his surprise the side of his house had disappeared. Then he was, with his wife, floating down the river in his four-poster bed. He commanded his wife not to stir and he propelled his bed, using his hands, sometimes his feet, till he reached the shore. Green was probably the Court House of Taintons before Radway Manor was formed, its main structure is likely to be much older than the date 1615 which was when the upper floor was inserted to the original big hall by a Cove when he married and inherited the house. The angel over the front door almost certainly came from the church. The Court of Radway Manor was held at Lower Radway and became the Court of the two manors and it was here that Courts Lest were held until nearly 1900. Lindridge is well documented since William Martyn bought it for £2,900 in 1614 It is said the buildings then covered an acre, but it was rebuilt about 1619 with two wings that were removed by Sir John Lear about 1690. It has changed hands many times since then and was burnt down a few years ago. The garden as it now stands was laid out by Milner White in the 1920s but many trees are a lot older. As for the ordinary people, we have in the parish registers the record of a collection, made nationwide, for the redemption of captives out of Algiers, Sally and other places on the coast of Africa. It is dated 1680 soon after Algiers and Tunisia came to Britain through Charles II’s marriage to Catherine of Braganze. Donors are listed house by house, as we know who could afford 2d or more and in whose house they lived. There are 25 larger houses where people with names other than the owner lived, and 69 tenements occupied by one family name; altogether 221 people are named. First is Sir John Lear, merchant, giving 10s, his wife Susanne 5s and 11 others in his house giving 6d or more. The Vicar, John Risdon, and Nic. Cove gave 5s each, and so the list goes on to reach a total of £8.10s 1d. This list shows how the bigger houses took in the sons and daughters of village people as apprentices and servants and it is a better guide to the population than another record which is of the people who paid a church rate. This was kept by the Churchwardens who levied the rate on those who owned or 16 rented land. Only 81 people paid this rate. So we have a total village population just before 1700 of about 450 men, women and children. Little Parlour, Great Parlour, Hall Pantry, Housekeeper’s Room, Drawing Room, Housekeeper’s Room by ye Kitchen, Dining Room, Best Lodging Room, Tapestry Closett, Great Corner Chamber, My Lady’s Closet, Nursery, Little Room by My Lady’s Closet, Housekeeper’s Lodging Room, West Room, Maid’s Chamber, Two Passage Rooms, Two Hind’s Rooms, Store Chamber, Purple Chamber, Two West Rooms, Corner Garrett, Little Corner Garrett, Mr. Spry’s Room, Lardry, Servants Hall’ Dairy, Corn Chamber, Brewhouse, Meal Chamber, Laundry, Cellar, Malthouse, Poundhouse, Kitchen and usual outside Stables, Barns, Coachhouse, etc. Sir John Lear’s plate was 4169 ounces of sterling silver, 435 ounces of Brittania silver, 64 ounces of uncertain silver and 199 ounces of other plate with a value of £300; there were 120 deer in the Park and another 112 other livestock. For other houses we rely on early wills. The earliest to survive is of Hugh Tapley who died 27th December 1587. He left eight sheep value 16s; his wearing apparel 10s, and in money 40s.No household goods, so he was probably an unmarried son. Then John Babbe who died in 1633. His family had farmed Lindridge but he was now on a smallholding in Luton. He left his wearing apparell x3 his bedding 40s, his pannes and crocks 20s, his wooll 30s, his timber Vessel 40s, his board and bedsteads 20s his harrowes, crokkas and laddrrs 20s, one acre of barley and beans 40s, one acre and a half of whet £6, one acre and a half of corn 40s, half an acre of rye 40s, half an acre of oats 10s, two kyne £6, three bullocks £5, one mare 40s, two calves 30s, 30 sheep and lambs £6.10s, four pigs 40s, his hay 30s, his quick end dead stuff 10, total £53.10s. A self-sufficient smallholder who grew six crops on five acres but had little in the house – no chairs. Then we have Gregory Babb the elder, a husbandman who died in 1643. His wife died within a week of him in a winter when 20 parish people died. This was twice the annual average so it must have been a hard, cold time that winter. Gregory was born here and was 28 when he married a local girl; he had a son within a year and a daughter the next year, no more, and he died 30 years later, aged 61. He left no ready money and his total estate was £33 but we have a picture of his house inside and out. In the hall and rooms adjoining he had an oil tapleboard and forms, no chairs, seven small pewter dashes and one saucer, six trenchers and six wooden dishes (a trencher is a wooden platter). He had two little brass crockes, one cawdron and a skillet, the crock hanger and crook. In the chamber over the hall, one low bedstead, a bed, blankett three sheets and one old coverlet, one other Joust bed (mattress stuffed with chaff), and one old chest. In the malthouse, one keeve of malting (a vat), one littletreadle (small carriage on low wheels), two hoggesheads, three little beer barrels and some small timber tubs, two Corn bags, and a peck (a corn measure). In the barn and abroad, four small pigs, a half share in a salmon net, a half share in a small boat, half the rapes and oars, a ring bittle (heavy wooden mallet) and two wedges, a pack saddle and girths, the house and pasture of the copyhold living till Michaelmas pay next, also things unseen end not valued 3s 4d. We must now pass quickly on to the 1700s when Anne and the Georges reigned; they left the village untouched. Christopher Coleman started a regular school in 1719 and left some of his money and land to the village; he helped build the old school and house about 1730 and it was absorbed into the National system in 1882, when the pupils numbered 140, having started at 23. The first schoolmaster was in charge for 38 years, a Robert Nosworthy who got the most dismal reports from the Inspector, year after year. This was corrected when Clifford Wallis was appointed head in 1888. He married his assistant and ruled wisely, enthusiastically and firmly for 40 years and is remembered in Wallis Grove and in his family who are with us still. Other events hers included the erection of a post in Broadmeadow and a celebration that cost 5s in 1765, all to celebrate Comyns winning an action against Lord Clifford to establish his right to the oyster beds in the river which ran clear then. For another celebration the Parish paid Thomas Comyns 189 for a sheep and is for a seam of wood to roast it, in 1762, the coronation of George III. In 1775, the parish presented Comyns in his own Court Leet for not providing a pair of stocks. In 1778 the parish paid Richard Knill 12s for making a pair, then 11 years later paid William Knott the same amount for another pair but this time added ironwork at 4s 6d and a lock costing is 6d. In 1792 the Irish Giant, nine feet high, dined at the vicarage and exhibited himself before the church gate; his name was O’Brien and he claimed Brian Boru as an ancestor. Later, beside getting nicely rich in London, he liked to light his cigars from the street gas lamps, His skeleton was preserved, and may still be so, at the Royal College of Surgeons. Another link we have with London is through a local family called Noble who lived at Clanage for 200 years. One member, Admiral Noble, who fought finely in the Napoleonic wars, claimed descent from a certain Thomas Parr who married first when he was 82 and second when 120; then after living through the reigns of ten kings was buried in Posts’ Corner, Westminster Abbey, aged 152 in 1635. Other people living here are described in the registers as Poor Labourers, Labourers, four Tailors, Sundry Husbandmen, Servant, Clerk, Mariner or Seaman, Butcher, Schoolteacher, Curate, Attorney, four Millers five Blacksmiths Yeomen, Sexton, Innkeeper, Cooper, Soldier, Waggoner, 12 Carpenters, M.D., Confectioner, Shoemaker, Thatcher, Gentlemen, Master, Coachman, Mason. The last, a mason, is interesting because he lived almost opposite Upper Radway, at the corner of Radway Court. Now these courts, which are found in Bovey and Chudleigh, were built by master craftsmen for their work-people. The master lived in a larger house on the main road where he could keep an eye on his workers’ end from which he would trade. Before I go on to the 1800s, let me list some of the 1700 or earlier village houses. Cockhaven Farmhouse and the homes towards Shute Hill, Spinnaker and Mary cottages on Radway Hill, Lower Radway, Ashill Farm, Causeway Cottage on Fore Street (originally Myrtil Cottage), the late-lamented Tapley, Park Farm cottages below the Central Garage, two Humber farms, Ashwell, Wear, Wolsgrove and Wood. All these survived a lot of rebuilding early in 1800s when the village attracted people who followed the vogue for the seaside but who wanted a property superior to those in Teignmouth. Turnpikes had made travel easier and there is said to have been a toll gate at Martin’s Park. Then in 1846 the first train ran between Exeter and Newton Abbot, with a seven foot guage and taking 45 minutes. At first this was no ordinary railway; it was silent as a tram would be because it was propelled by air pressure in a large-bore tube laid along the lines. The designer and surveyor of the system, called an Atmospheric Railway, was the famous Isambard Brunel and it was the only purpose-built railway of this sort ever built. Brunel had pumping stations erected at intervals, one is still standing at Starcross, another is now part of a supermarket near Torbay Hospital, a third was at Wear Farm where all you can see now is a large pond near the bridge over the railway. It cost £400,000 to build and at first carried 12,000 passengers a week. The fare was 2d first class, 1 ½ d second and 1d third between Exeter and Teignmouth. The system was abandoned after four years because the faults were overwhelming, one of which was that rats ate the leather gaiters used to keep the system airtight. Houses built at that time include Murley for an Admiral Thornborough, Bishopsteignton House originally called Hollowmead, Huntly, Kittoes, Lindrick though this carries the name of an earlier house, Cross House, St. John’s House – a vicarage since 1348, the Church Houses, Upper Radway, Delamore, Higher Green and three almost identical houses, Cross Gate, the Ring O’Bells and Rose Cottage, This last, opposite the door of the Village Hall, is on the corner of the once village green where an almshouse stood and a well was situated in the road at the Inn. In 1842 the Parish Authorities decided to sell this almshouse as it was decrepit. On 26th May at the auction, a man called Hammond bid highest and gave an I.O.U. as deposit. He started pulling the house down and refused to redeem his I.O.U., claiming the Authorities had no provable title to the property. He was taken to law and the Authorities won. In 1847 they regained possession but had to sell the almshouse to pay the cost of the suit. It is a coincidence but exactly 100 years previously the excommunication I mentioned was on a man also called Hammond. The population figures covering the 1800s clearly show the influx of people. Early there were 148 houses and 753 people of all ages here, of whom 400 were engaged in agriculture. By 1850 1124 people lived here; a directory divides these 1120 into 21 gentry, 32 tradesmen, 14 formers and 1080 others. In 1901 there were 241 houses and 1076 people living in them. That is 100 (62%) extra houses and 300 (40%) more people, and most of this increase occurred in the first 50 years of the century. From 1900 to the present day, the number of houses has increased tour-fold but the population has only doubled. The building of those extra houses in the 1800s brought with it a need for more trade in the village and we find butchers and slaughterers, bakers and cake-makers, smiths and farriers, gardeners, shopkeepers, laundresses, a postmaster and even a gasworks manager trading here in addition to those I mentioned before. There is certainly a large amount of material ready for a researcher to dig out for the 1800s and 1900s, for instance there is the water system and gas lighting, both of which have early remnants. Those little niches at the sides of some roads are where the communal street water taps were set, and there are one or two iron brackets set up on wells where the gas lamps were. Before I finish I must say a little about the church but I’ll deal with it in the way you would look at any early building to discover the period of building and the way alterations have been made. Start outside the East end, furthest from the road. There is a very old, possibly pre-Norman lancet window high up, and above it you will see a change in the stonework that. shows the original roof-line clearly, some feet below the present roof; this is repeated in the well of the North aisle. On your left is one buttress where you would expect two at right angles. Look carefully and you will find the second built into the wall now, to show the chancel has been widened at some time. On the South wall, there are two blocked doorways; the smaller one west in fact, used by those parishioners who had paid for seats in the present-day choir stalls. The other has the signs where a porch once stood over it; this is the women’s door where once marriage contracts were sealed and troths were plighted. Over it stands a very fine tympanum, showing the Adoration of the Magi, carved in stone to fit between the lintel of the door and the curve of the archway. The Virgin’s clothes give a pretty exact date for the making of it – in the 1150s a few years after the church was built. Strangely, the designer has given the Virgin a dress appropriate only to married women of that period. You might just remark that its composition is closely similar to a carving on a box belonging to the Venerable Bede who died in Northumberland in A.D. 600 and you could assume the design was made by a friar who had been educated up there and was at Radway later. Still on the south side, the stonework alters part way along with the division clearly marked with a vertical line of white dressed stone. In fact it Is the line of the turret stairway leading up the original tower which existed till 1816 between the original nave and chancel. This tower was taken down and the stone was used for the present tower on which a steeple was erected. That fell down and you can now see a change of stonework where the damage was made good. In the tower you can find, if you really delve, two tombstones actually built into key points of the structure. Stop at the main door and look carefully at the carving over it. Nominally it is Norman work but the Gaelic, that is Irish, influence is obvious There are not many others like it in the country. Once inside you will find the floor has been raised, that was to cope with dampness; you’ll find an early Norman font and some early window frames on the north side; as opposed to quite recant ones on the south. Did we have a rood screen at the chancel crossing, a feature of so many Devon churches? Yes, we did; you’ll find the pillar nearest the organ cut away at its bass to take a support. While you’re there you will see on the north wall a Martyn Monument; that was where the stairway to the top of the rood emerged, but you will need to go outside to see the buttress in which the stair itself is built. Before you go outside, take a look at the pillars and see our famous leaning one, best seen from that Martyn tablet. It has been like that for over 400 years. Outside on the north side there is a bit of a Saxon doorway, a low narrow door, known as the Devil’s Door, that was opened for baptisms since the devil was reputed to fly away always northwards. Incidentally, most of the graves just to the north of the church are those of the gypsy families who used to live on Haldon. On your walk back to the road, to the north of the main gate, you can find the piers that once supported a footbridge between the churchyard and the vicarage garden. This was removed only early this century; it’s purpose was to avoid having to walk through the stream running down Shute Hill into Stockmeadow, but which is now piped underground. One guide describes the building as a barn of a place; that is true enough but in its detail it is fascinating and well worth preserving; so if you would like to help us do just that, we are always grateful for contributions. Richard Martyn of Lyndridge, knight, happiest of the imitators of Mithredites in the diversity of his tongues and of Alsted in the encyclopaedic character of his knowledge, but in the natural splendour of his genius and the symbolic charm of his words no mere imitator and incapable of being imitated. All who were the nobler in nature and disposition deemed among themselves that they achieved excellence according as they came nearer to the Martyn character. The most musical of musicians, a hero among brave men and a god among churchmen he had nothing mortal in him save that he died an August 13th 1659. Ricardus Martyn de Lindridg armig. Varistate linguarum Mithraditis encyclopaedeia acientiarum Alscedij imitator foslicisaimus genii fulgore genuino verborumque lepore symbolizante non imitator haud imitandus quot erent indolus et prosapiae nobilioris tanto inter Praecellere ae existimarunt quanta ad mores Martinos propius acceserunt musicos mousikotatos generosos heroicus eccleaiasticus divve non aliud habiut mortalis nisi quad obijt 13 Auguati 1659.